Once a comfort station for motorists on the Columbia River Highway, Vista House turns 100 as iconic landmark. Centuries ago, the land now known as Crown Point was believed to be a "vision quest" site for Native Americans. 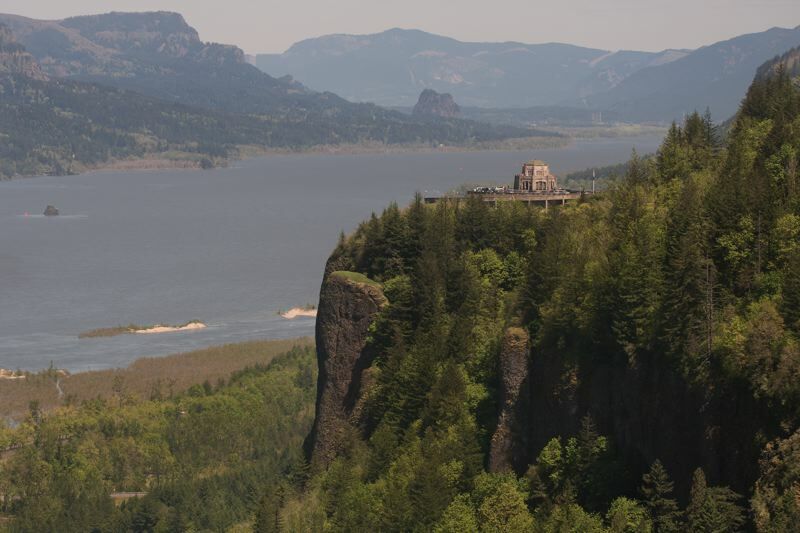 The rocky outcropping 700-feet above the Columbia River was a desired spiritual location because of its isolation, sweeping three-sided canyon view and frequent visits by low-flying eagles. In the company of a tribal elder, young Native American men and women would spend three days fasting, awaiting a vision from the Creator to help direct their lives. Today, the Vista House at Crown Point stands as a monument to the grit and resilience of a different type of tribe — community volunteers who heeded a calling to preserve and protect a historic landmark enjoyed by millions each year. "The structure stands on one of the worst places weather-wise, but it's a link to the past that is reassuring," said Ken Manske, president of the Friends of Vista House Board of Directors. "At a time when everything is so turbulent, Vista House fosters an opportunity to talk about the beauty of nature and community in a non-threatening place." 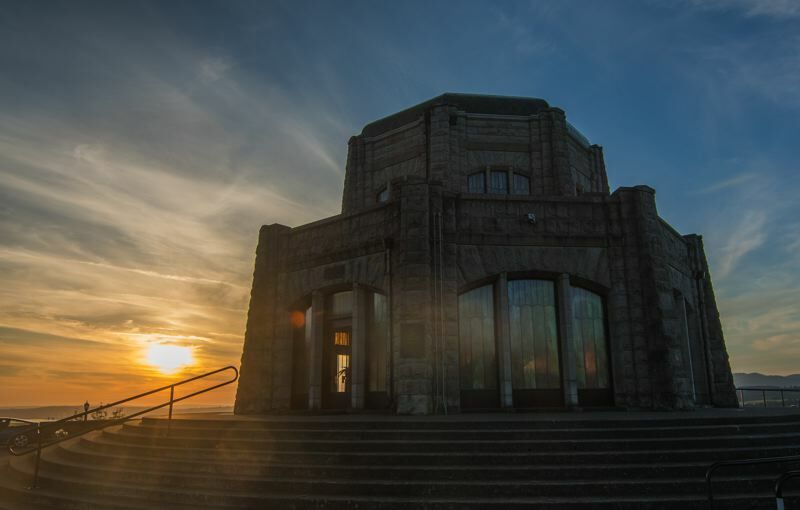 Earlier this month, the Vista House celebrated its 100th anniversary. The event was marked by a re-creation of the pomp and ceremony of its original dedication on May 5, 1918, with brief remarks from local dignitaries and a traditional flag raising by Portland's Royal Rosarians. But for the volunteers in period clothing, the re-dedication symbolized the continuance of a century-old vision that stemmed from a fairly simple idea. 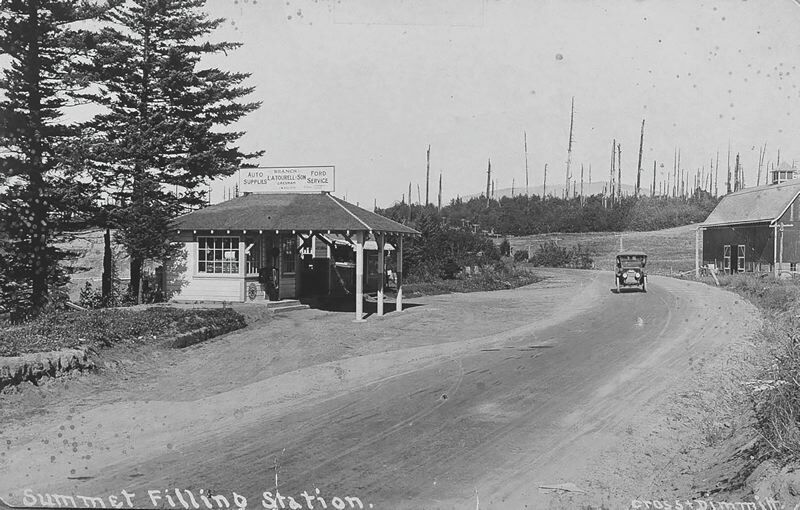 In the early 1900s, as construction of the Historic Columbia River Highway progressed, the need for a "comfort station" for motorists along the east-west route took hold. Engineers designed a simple rest area to be constructed on a promontory called Thor's Heights, so named for the Norse god of wicked weather. Eventually the area was dubbed Crown Point as a more positive reference to the Norse god, known for wearing a gold crown. Lorens Lund was an early settler in what is present day Corbett. He moved his family to the remote area from Portland via steamship in 1878 and quickly became a wealthy landowner. The few roads leading to the Gorge at the time were rough and unpaved, making personal and commercial travel difficult and slow. To bring progress to the area, and increase tourism that could prove financially beneficial to his landholdings, Lund sold a parcel of his land on Thor's Heights to Multnomah County for the highway. He then donated 1.5 acres to the city of Portland for what would become Vista House. 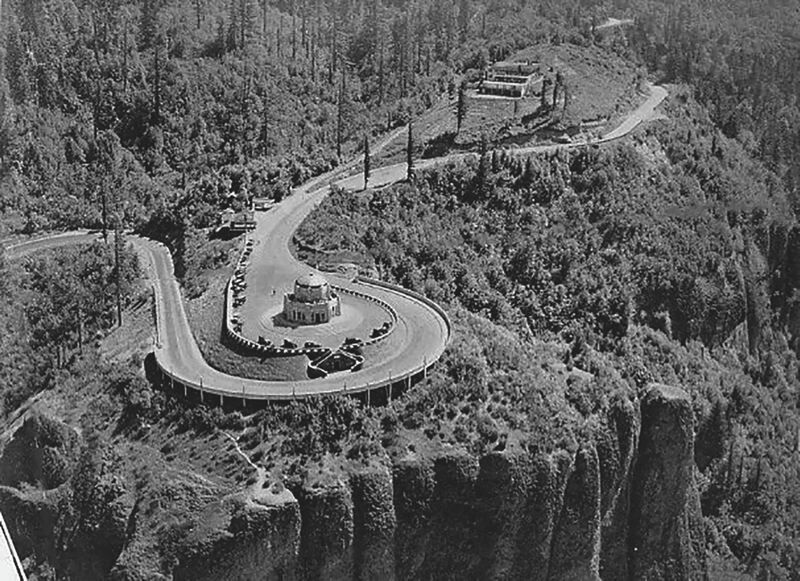 A group calling itself the Vista House Committee secured $18,000 from Multnomah County in 1915 to begin construction of the rest area. Additions and changes to the original design quickly skyrocketed the costs to $100,000, however, and what was originally supposed to be an unpretentious facility, built mostly underground, suddenly blossomed into a three-story building adorned with Alaskan marble flooring, a clay-tiled roof and glass skylights. It was intended to be known as the "Queen of Rest Stops" for the "King of Roads," the moniker assigned to the nation's first paved highway. Samuel Lancaster, one of the masterminds behind the historic highway, was among several wealthy local businessmen who donated funds for construction of the Vista House. Lancaster recruited John Yeon, his friend and Portland developer, to oversee the Vista House project as chief construction manager. Yeon knew that any structure built on the exposed cliff would have to be strong enough to withstand the often brutal Gorge weather conditions. Yeon chose Edgar Lazarus as the designer of the "comfort station" because of his knowledge and skills with stone construction. But from the beginning, the project was fraught with stumbling blocks. Along with huge cost over-runs, Vista House, for years, was locked in a tug-of-war among concessionaires jockeying for their share of what they were sure would be big tourist dollars. Vista House was also viewed, by some, as an unnecessary and out-of-the-way stop available only to the wealthy. Yeon stood firmly behind the project, despite its costs, and willingly accepted the role of fall guy for what some felt was a folly. "Yeon saw Vista House as something monumental," Manske said. "He was charged with building a rest room, which he did, but he had a larger vision and since he controlled the purse strings, I don't think he cared about the cost." 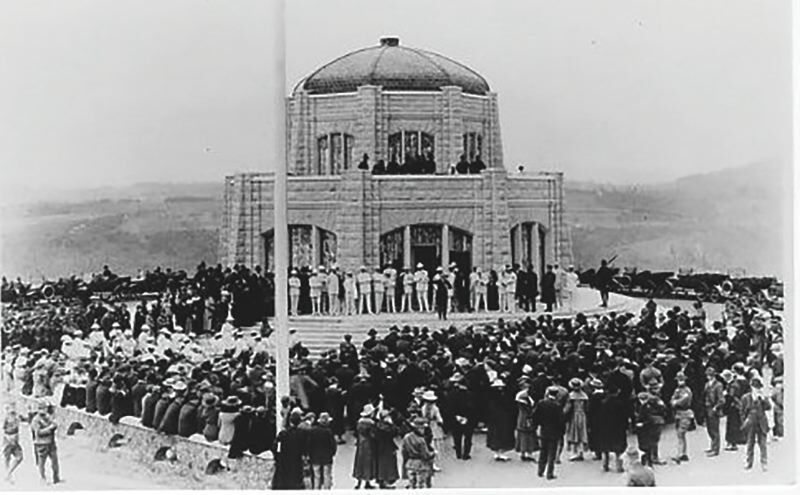 Vista House was a marvel when it was officially dedicated on May 5, 1918. The building had electric heat (in the basement only), stunning marble floors and a rotunda with windows offering unsurpassed views of the Columbia River Gorge. One concessionaire was granted permission to sell souvenirs, while responsibility for upkeep on the facility was passed to Multnomah County. 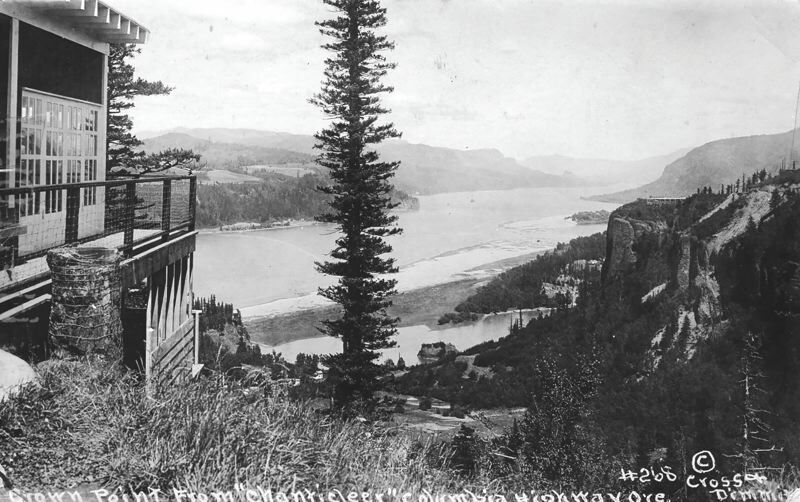 Once the Columbia River Highway opened in 1917, Vista House did indeed become the hoped-for tourist destination. Business opportunities boomed in the 1920s for local entrepreneurs who opened gas stations, eateries and inns along the road between Chanticleer Point (now the Portland Womens Forum) and Crown Point. But during Vista House's construction, Lazarus had recommended an on-site caretaker to prevent theft and vandalism, in addition to a financial reserve dedicated to maintenance and future repairs on the building. Lazarus predicted that because the structure's exterior was built with stone, it wouldn't take long for the cement, tile and iron fittings to fail. Neither of Larzarus' recommendations were taken seriously and 10 years after its monumental dedication, Vista House was already falling into disrepair. Without a budget for maintenance and repair, Multnomah County was hogtied to do little more than listen to complaints about the structural failings of the Vista House. Complicating the funding issue was the fact that none of the concessionaires inside the facility were required to pay a consignment fee for their sales, meaning no money was going into a pot to support the facility. 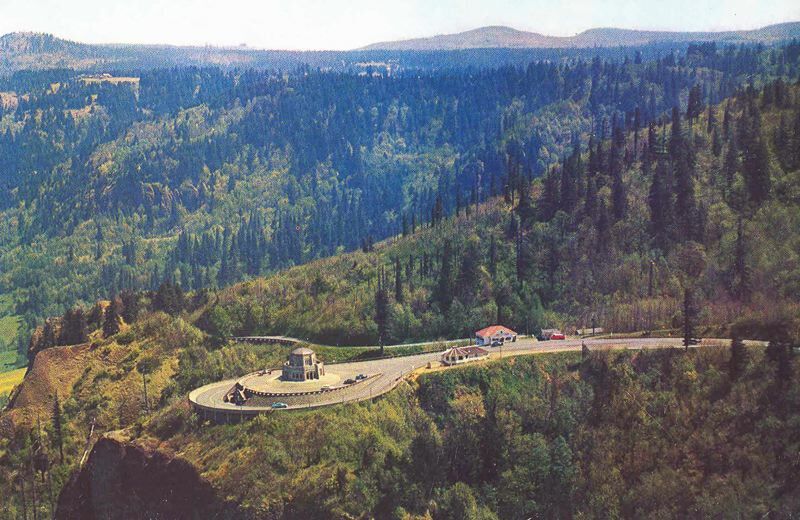 In 1938, the Oregon State Park system, then a division of the State Highway Commission, placed Vista House under its umbrella as a park. The structure was evaluated for needed repairs, which uncovered cracks in the tile roof and leaks in the observation deck tile floor. Repairs took two years and $10,000 to complete. Throughout the ensuing two decades, Vista House continued to decay. Restrooms needed updating, the building lacked air flow to keep the interior dry and the highway commission refused to replace the non-functional exterior lights surrounding Vista House, saying they were unnecessary since the building closed at 8 p.m. The iconic structure was so deteriorated that demolishing it was a consideration. In the late 1960s, led by a number of Corbett residents and Columbia Gorge activists, a nomination to place the Vista House on the National Register of Historic Places was made to the State Parks Department. The hope was that the designation would open the door for funding to maintain the building. Vista House was named a National Historic Landmark in 1971 and added to the National Register of Historic Places in 1974. By the 1980s, a movement to preserve the scenic gorge area was gaining momentum. So was the number of visitors to Vista House. But inadequate funding from the Oregon Parks and Recreation Department, as well as the U.S. Forest Service, created a need for staffing during the landmark's "season" from April through October. Volunteers from Corbett and surrounding communities took on the staffing duties, greeting visitors and dispensing historical and travel information. As the urgent need for restoration funding became clear, a core group of volunteers founded the Vista House Project committee and began exploring state and federal grants for historic landmark preservation. Members of the VHP entered into an alliance with the not-for-profit Northeast Multnomah County Community Association (NEMCCA). The partnership allowed VHP to accept public donations and apply for grants under NEMCCA's nonprofit umbrella. Volunteers from the community continued to be the driving force behind cleaning and repairing what could be repaired before the Vista House opened for the season each spring. In 1988, the VHP separated itself from NEMCCA to become its own nonprofit entity. The group was renamed the Friends of Vista House and began a formal working relationship with the Oregon Parks and Recreation Department that continues today. The Friends board launched a membership campaign with dues being an important source of funding, and regained control of the Vista House mission. "A challenge to raise the money"
But in order to return the aging building to its original glory, the group needed money — big money. After years of reliance on volunteer skills, labor and community fundraisers to Band-Aid repairs at the facility, the Friends of Vista House commissioned a comprehensive study by a Beaverton architectural firm in 1995 to ascertain what it would take to completely restore the Vista House. The price tag was $1.4 million for "top priority items" (structural integrity; ongoing moisture in the rotunda) and more than $222,000 for "lower priority items" (lighting, historical features and finishes). "I don't think it was a surprise to anybody because Vista House was in bad shape," Manske said. "It was a challenge to raise the money, but at least it got things started." Between 1998 and the spring of 2000, the Friends fundraising committee applied for numerous grants and engaged the community through events. They also worked in conjuction with the Oregon State Parks Trust, who contributed the bulk of the $1.4 million need to preserve the landmark. Small restoration projects were completed on the interior, but in August 2001, a chain-link fence was erected around the structure as a $1.1 million exterior overhaul began. In April 2002, for the first time in its history, the Vista House did not open for the season. A temporary trailer was brought in to serve as a visitors center, with volunteers dispensing popcorn along with Gorge travel information. As work proceeded on the exterior, the Friends of Vista House hit the fundraising trail hard to secure financing for an interior restoration. A series of federal and local grants, along with an auction and successful membership drive, provided FOVH with the backing they needed to launch the overdue interior restoration. Vista House was shuttered to the public for four long years, but on April 28, 2006, despite some last minute hair-pulling over occupancy permits with the city of Gresham and ADA access, the iconic landmark once again received visitors. Today, an estimated 4,000-5,000 people grace the doors at Vista House each day. Manske credits that tribe of volunteers who poured their heart and soul into preserving Vista House and molding it to be much more than the "comfort station" as it was originally intended. "I think Lazarus would be surprised to see what (Vista House) has become," Manske said. "There were a lot of wonderful, wonderful people, who gave their time and money. It's because there were so many people who believed in Vista House that it's still here today."